Most of us spend way too much time in our cars, and all that time behind the wheel can cause your ride to start to develop some nasty smells. Nobody wants to have to plug their nose every time they have to run an errand, and you cannot always roll the windows down and let in some fresh air. That is why it is important to keep a good air freshener on deck in your car to help alleviate some of those unpleasant lingering odors. A good air freshener will be portable and work well in your car. On top of that, you need to make sure that you love the scent since you will be smelling it a lot. It cannot be so faint that its ineffective, but if it is too overpowering it will probably give you a headache. It can be a little confusing figuring out which air freshener to pick, so consult this helpful guide to can make the best decision possible and have your ride smelling brand new again. What Should You Look For In An Air Freshener? While all air fresheners are likely better than the disgusting smell you are trying to cover up, there are a lot of different things to consider when deciding on the best air freshener for your vehicle. The perfect air freshener for your ride will have the perfect scent, be easily portable, and be easy to maintain for a long period of time. This section will help you determine what you should be looking for when examining those three things. Air fresheners first and foremost are supposed to smell good, so when you are starting your purchasing journey that should be the first thing you consider. There are a variety of different air freshener scents to choose from. There are lots of neutral scents that will not offend anyone’s nostrils. Or maybe you are more interested in the tropical aromas, which can be delicious but sometimes overpowering to the point of inducing nausea. Other scents try to be more masculine in order to appeal to the tough guys who need a tough car that smells tough. And then there is the ubiquitous yet indescribable new car smell that will have your vehicle smelling brand new, sort of. Whatever scent you decide on, just make sure it is something you will not mind smelling over and over again. A car air freshener really needs to be as portable as it is fragrant. You cannot just bring lit candles or plug in fresheners that require outlets and expect them to do the job. Most car air fresheners are simple to install and stay out of the way, which is exactly what you want. Fresheners that hang on the rearview mirror or clip into the air vents are great for visibility, which is great for safety. Plus, they tend to spread throughout the car much better. Nothing is worse than getting into your car once your air freshener has run out and smelling all those unpleasant odors that were neutralized before. That is why you want an air freshener that is consistent, durable, and reliable. Otherwise you will be replacing it every other day, which will be a big pain in the wallet. Some air fresheners have pods that you refill and replace, while others are only good for a single use before you throw them away. However, that single use could last longer than the replaceable pods, so it all depends on which air fresheners fit your lifestyle and preferences the best. 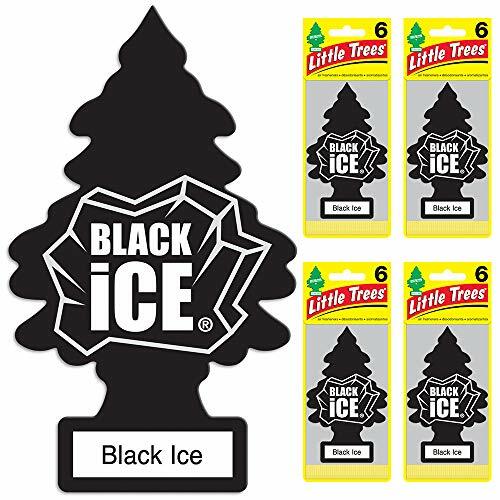 The Little Trees U6P-60155 Air Freshener is a classic. It is what you think of when someone mentions a car air freshener. The iconic little tree design hanging from the rear view mirror is still a great option for a car air freshener. It comes in a variety of inexpensive scents to suit any nose and any budget, plus you can order in bulk and get a 24 pack for a great deal. These air fresheners are small and out of the way, the perfect portable option. The Little Trees are not perfect, however, as there have been a lot of innovations in the car air freshener game since their inception. They are typically not as strong as other air fresheners, and they also do not last quite as long. But there is a reason the Little Trees are classics, as they are still a solid choice at an easy price. 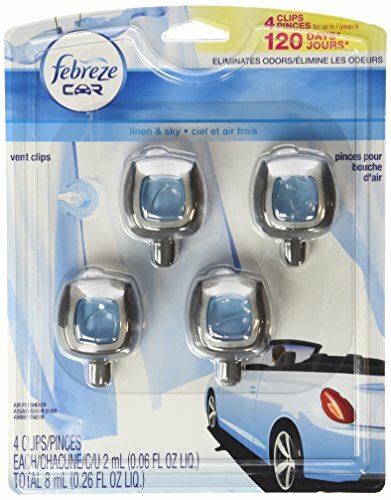 The Febreze Car Vent-Clip Air Fresheners make the most out of the space they have available. These fresheners clip easily into your front air vents, perfuming the air that flows out throughout your vehicle. These air fresheners come in packs of four, so you can make them last a while or really fill your car with powerful freshness. They also have a very strong scent that will absolutely overpower any lingering unpleasant odors in your car. The Febreze is an excellent portable option with a variety of exciting scent options, but it is not the longest lasting option. You might find yourself replacing these air fresheners more often than you would expect, especially if you really crank the heat. 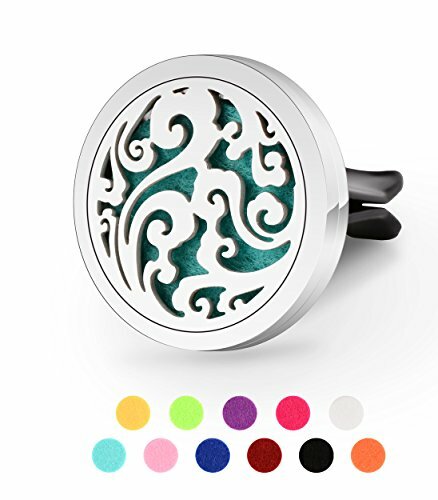 The GerTong Vent Clip Essential Oil Diffuser for Car Air Freshener is a small but effective option that also makes a bold style statement. While most air fresheners just try to stay out of the way and unnoticed, this one boasts an attractive design without sacrificing any portability or being too big and obstructive. This air freshener is easy to install and refill, and many users praise its therapeutic and calming effect while driving. The GerTong is not for everyone, as you will need to provide your own essential oils. So if you do not have some already and are not interested in learning about them, they are probably not for you. Also, if you have a larger car, this air freshener might not be strong enough to fill the entire vehicle well. However, it is still a stylish and effective option with its own unique benefits. 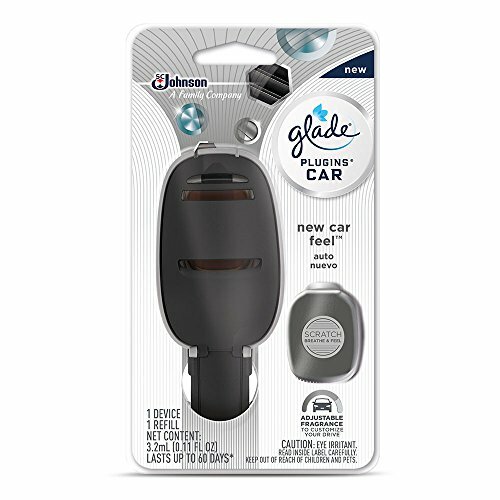 The Glade PlugIns Car Air Freshener Starter Kit is an excellent idea for those people who are very particular and like to mess with the settings to get things just right. It is one of the only air fresheners with adjustable settings for how strong you want the scent to be. It also comes with a number of refillable scents to please even the pickiest nose. The Glade PlugIns is an electronic air freshening, so it uses energy from your vehicle to power its fragrances. It gets plugged into the 12V outlet and only works when the car is on. Despite this, the refillable scents go by quickly and need to be replaced fairly often. The Chemical Guys AIR 101 16 Premium Air Freshener and Odor Eliminator is different from a lot of the other car air freshener options because it comes in a spray bottle. This is a two edged sword, since you only use it when you need it and do not waste but also have to manually spray every time there is an unpleasant smell. This super concentrated formula is very effective, however, and will typically cover up bad odors for a long time. It uses enzymes to seek out and destroy odors from the source. The Chemical Guys’ spray bottle design can be useful for preventing waste, but it also comes at a price. If you are not careful, you could wind up using it all too quickly and then be out of luck next time there is a funky smell in your car. On top of that, when this freshener is not diluted the smell can sometimes be overpowering and even unpleasant for some user. 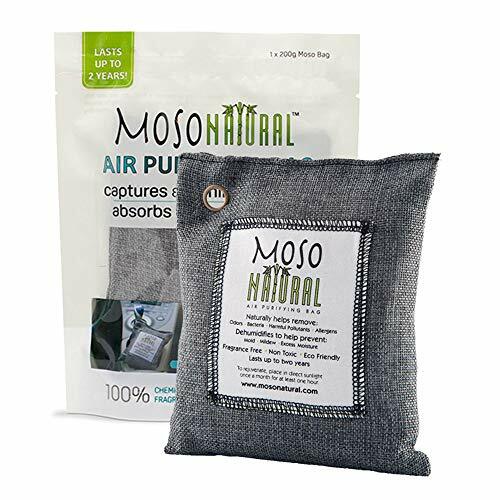 The Moso Natural Air Purifiying Bag Odor Eliminator is another option with innovative design. This air freshener is a small bean bag filled with natural ingredients that eliminate bad odors and spread pleasant scents. The bag also soaks up excess moisture in the air, helping you stay dry and breathe easy. This air freshener is also very durable and the active natural ingredients keep producing great fragrances for a long time. The Moso Natural is a great eco-friendly option, but it might not work as effectively as other air fresheners do. The scent it puts off is not as strong, and it needs to be in a fairly prominent position to really be effective. That means it will likely be somewhere in your way, obstructing your view. 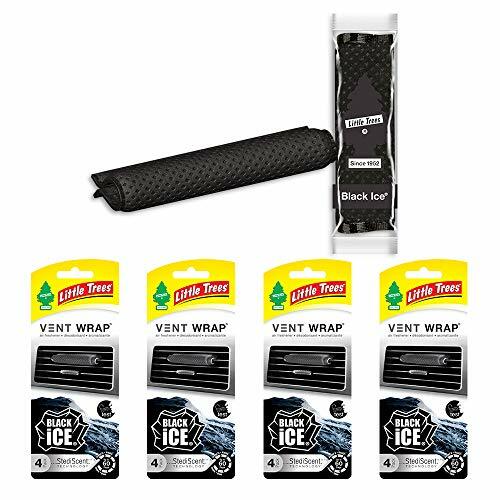 The Little Trees Vent Wrap Air Freshener is another sneaky air freshener that provides pleasant fragrances while not taking up too much space. They are barely noticeable when clipped into your front air vents, and they are designed to only allow the perfect amount of scent out at a time. This way they are always refreshing without ever being overpowering. This freshener comes in a variety of different scents, so you can find the one that you like the best. The Little Trees Vent Wrap is another air freshener with refillable scent pods, but they tend to run out very quickly. All those replacements can start to add up pretty fast. On top of that, they leave a sticky residue on the vents when removed, which can be a real pain to clean out of such a small space. 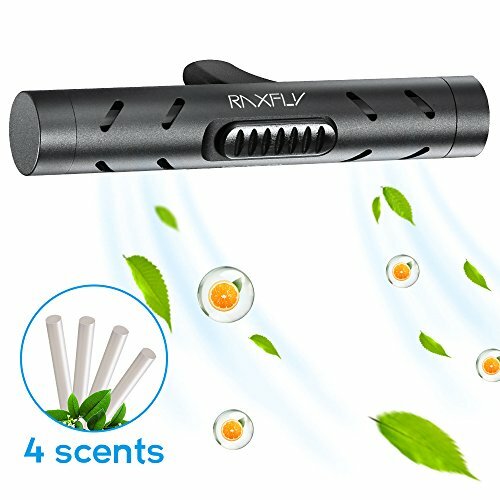 The RAXFLY In Car Air Vent Freshener uses four scent bars and a sponge bar to destroy gross smells and release nothing but pleasant fragrances. Once this clips into your vents, it will spread one of the four different natural aromas it offers. These scents last a fairly long time, and once they do run out they are a breeze to refill. The RAXFLY is small, portable, and discreet. This makes it useful for cars but prevents it from being as strong as other air freshener options. But this air freshener’s original natural scents and easy refilling make it a great choice for most vehicles. The right air freshener can make your ride ten times more pleasant. Instead of trying to ignore the nasty smells by holding your breath, take big whiffs of a fresh scent you love. No more crushing embarrassment when picking up a friend or a date, because with a good air freshener your old car will smell and feel like new again.